The MV Plancius arrived at Tristan for a three day visit on the 11th April 2018. The MV Plancius arrived at Tristan on Wednesday 11th April 2018, but due to bad weather she had to go to the lee where it was much calmer. 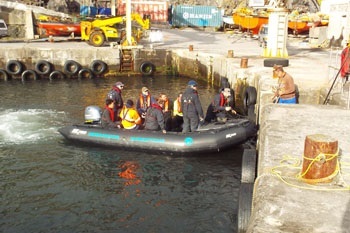 Thursday morning she came back up to Tristan, although unfortunately disembarkation was slow due to the sea conditions. By 11:00am the visitors were very relieved to finally be ashore and taking part in the guided tour to the 1961 Volcano followed by a visit to the Thatched House Museum. During the day visitors enjoyed a visit to the Potato Patches and exploring the settlement. Bird enthusiasts were even fortunate enough to see a Tristan Thrush and Gough Moorhen. Souvenirs and philatelic material were bought and mail posted. 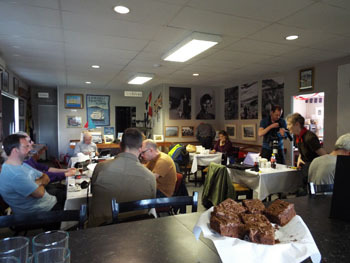 Snacks and refreshments were enjoyed at Café da Cunha and the Albatross bar. By 5pm all passengers had boarded the ship, along with four guides ready for the following day at the outer islands. Passengers landing in Calshot Harbour. 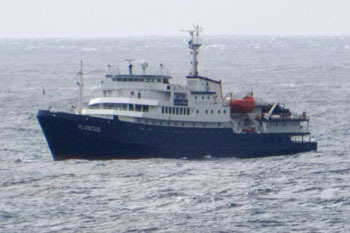 MV Plancius off the settlement. Passengers in Café da Cunha enjoying refreshments and using the new wi-fi. 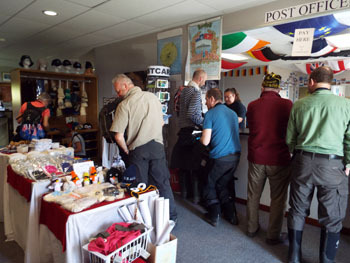 Passengers buying stamps and souvenirs in the gift shop and Post Office. If you were on the MV Plancius, we'd appreciate your feedback using our Visitors' Feedback Form.